Industrial piping systems can be used to transport many different types of fluid, not just water and are often referred to as process piping systems. Commonly transported liquids include various types of gas, oil, paint, mining slurries, chemicals and food products or ingredients. For a great many of these systems, metal pipe is used. Unfortunately, metal plumbing pipe is prone to developing two types of corrosion, including pitting corrosion and crevice corrosion. The types of materials transported through process piping or industrial piping systems are often more viscous than water. They may also contain chemicals or components that are mildly abrasive, which speeds up the process of corrosion, specifically pitting and crevice corrosion. Pitting corrosion is characterized by the formation of tiny pits in the metal. This occurs when the material of the metal pipe is slowly worn away over time, but the wear is not uniform across the pipe. Instead, small holes or pits are created. This type of corrosion can be extremely difficult to detect because the damage is not often known until the pipe starts leaking. The pits in the pipe may be narrow and deep, elliptical-shaped, wide and shallow, horizontal or vertical. It’s also difficult for piping manufacturers to predict and design against, due to the plethora of factors that can contribute to metal pipe pitting. Regular camera inspection may be able to detect pitting before it compromises the integrity of the pipe. 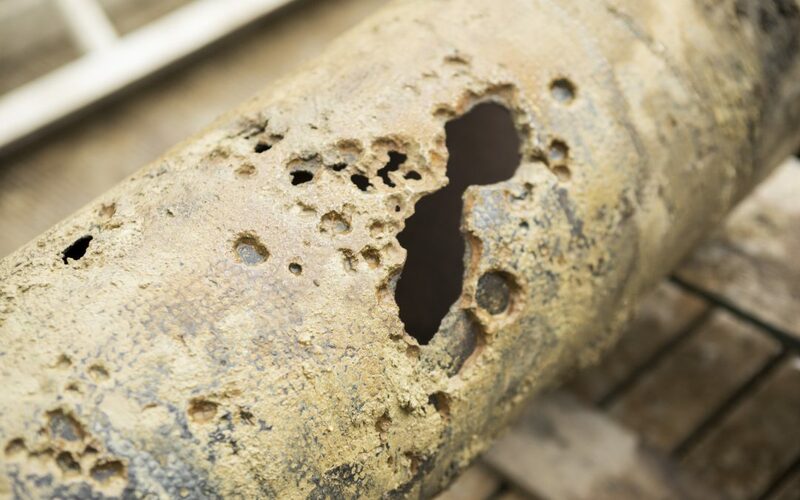 Crevice corrosion is another common type of corrosion found in industrial piping systems. All types of pipes have joints, seams, fitting and potentially welding lines where pipes of various lengths are connected together. This type of corrosion occurs because some of the liquid becomes stagnant or gets ‘stuck’ in the crevice where it sits for an extended period of time. If the liquid is acid or mildly abrasive, even on a microenvironmental scale, it can cause the deterioration of the seam or joint. As the crevice is worn down, cracks appear, which can lead to leaks and pipe blowouts. In order to prevent crevice corrosion, industrial manufacturing plants should schedule regular pipe inspections. When it comes to preventing and solving industrial pipe corrosion, preventative maintenance and proactive repairs and rehabilitation are a must. Here at Nu Flow, we offer Building Pipe Assessments and pipe lining to help rehabilitate pipes with pitting and crevice corrosion. Our Building Pipe Assessment includes a camera inspection of your industrial or process piping system, a detailed report of the findings, including a remaining useful life estimate and an estimate for epoxy pipe lining. Epoxy pipe lining helps extend the useful life of your industrial piping system by sealing and filling pits and cracks and preventing the product flowing through your plumbing pipes from coming into contact with the metal, which prevents future corrosion. Pipe lining also helps smooth your pipes and maximizes the internal diameter, which can increase the flow rate. The process of pipe lining is also trenchless and relatively fast. This means that we do not have to dig through walls or concrete to line your pipes. Instead, we often use existing access points to install the epoxy liners or coatings, and all of our pipe lining services are guaranteed and warrantied for 10 years. To learn more about pipe lining and how it can help extend the useful lives of your industrial piping systems, call us at 815-790-9000.